Housing is where you keep your rat when it is not out and about with you. It provides a safe haven for your rats where they can feel safe and secure and keeps them warm in the cold weather. Occasionally an owner chooses to free range there rats permanently allowing them access to most areas of the house at all times. This is a nice idea in principle but unless your house is fully rat proofed will be quite dangerous to both your rat and your belongings. Even in the case of free living rats it is good for them to have there own safe space in the form of housing. For a long time a large aquarium or ‘rat tank’ was considered an ideal home for rats. Even now single level plastic tanks are often sold as suitable rat housing. Since those early days of aquarium use much has been learned about our furry companions and the aquarium/tank’s faults have become obvious. The most problematic of these faults is the poor ventilation. As will become obvious in the health section, Rats are very sensitive to anything that can affect their breathing and have a natural tendency towards respiratory infections. Aquariums allow few drafts, a fact that makes them good hospital and nursery housing but unfortunately allows the build up of ammonia from the rats urine, this irritates a rats lungs and makes them more susceptible to illness, sniffles and wheezing. It is possible to frequently clean the rat out to limit this but it could require daily cleaning and the aquarium is still not the ideal home. One solution to this problem is to build a second wire mesh storey into the roof of the aquarium. This allows the rats to get out and smell the world so to speak. Some owners even combine a cage top and aquarium body by attaching a cage to the top of there aquarium in a similar style to a geblarium. This can help but is a fiddly and often expensive way of achieving the same result as a cage. One of the most frustrating faults with an aquarium is the difficulty in attaching any shelves, accessories, toys or hammocks to its smooth walls. Some luck can be found with the sucker style attachments but most times the rat kindly chews these fixtures to pieces. An extension can help and give you some extra area to attach things but it is still limited and so not ideal. Rats love to climb in fact girl rats in particular seem to live to climb. They are never happier than when perched at the very top of that book shelf or balancing precariously on the coat hook having scaled your coats. An aquarium offers few climbing opportunities and as such can lead to chubby under exercised rats. One way to remedy this is to add sticks and branches. Avoid fast growing trees such as pines and other soft woods. Fruit trees are the safest branches to use and you can buy them from pet shops (generally for birds) or find them in your local woodland, just be careful to disinfect and dry them or pop them in the freezer for a few days before use. If you still wish to get an aquarium/tank or tank based cage then it is important to get one that provides sufficient space for your rats. See the Cage size section for the guidelines on this. Cages are considered by far the best form of housing for rats in most circumstances. They offer a ready made ratty play pen and allow plenty of flexibility to add and adapt toys and accessories. Currently nearly all experienced and informed rat owners in the UK keep their rats in cages using tanks only for ill or pregnant/newborn rats. There are several disadvantages to cages such as the ability of the rats to chuck litter and food out and the occasional rat urinating through the bars (it might sound un-clean but to a rat it is merely keeping it’s environment as clean as possible at the expense of yours). Cages can also be drafty if kept in the wrong location though this is easily fixed by changing location and adding draft free nesting boxes. Some rats can injure themselves falling in some of the taller cages but hammocks, shelves and boxes can be strung overlapping to prevent long drops. Asides from these there a few disadvantages to a good cage. You can get good cages in several forms, some of the best rat cages are actually aviaries, or ferret cages. You can also get very good rabbit cages which can be suitable for rats. There is also a growing number of cages marketed specifically for rats that are actually suitable for them (10 years ago this would have been seen as a near miracle). However as with everything it is easy to get a bad cage. For information on what to look for in a cage please see Choosing cages. 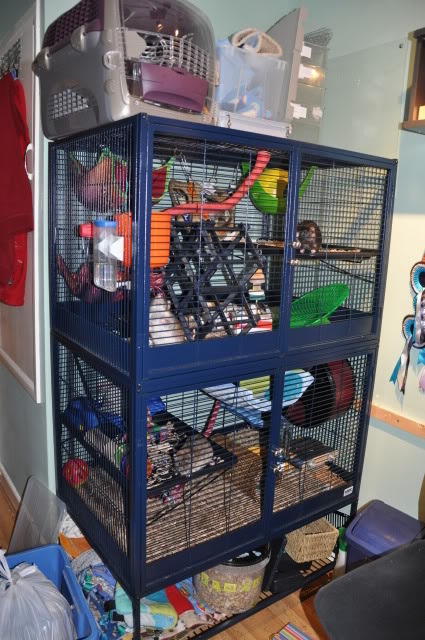 Now where to put your cage, this varies a lot on the household and depends on space available, how the area is used and how rat friendly the other residents are. Common Room / Area This includes lounges and other places where people most often are. It is a good place to keep rats as generally there is a lot of activity for them to watch as people come and go in front of them. It will also give those people sharing the area a good opportunity to watch and interact with the rats which are often more interesting than TV. It can be a problem if a member of your household dislikes rats or if any of them suffer from allergies. Rat Shed This is particularly popular with breeders and those who keep large quantities of rats. It can provide a very good space to keep several cages and all the associated rat toys, bedding and food. It can also allow you to have a rat proofed area for free ranging with minimal effort. The rat shed is what you make of it but generally takes the form of an outbuilding that has been well insulated and is heated as fancy rats are not outdoor pets and need to live between 10 and 25 degrees C. Often people will use the argument that wild rats live outside perfectly happily but it should be noted that our Fancy Rats have been bred separately for many decades and so have lost many of there wild characteristics and hardiness. Care must be taken to make sure that the rat sheds temperature not only stays warm enough but doesn’t become an oven in summer. Many rat shed owners invest in air conditioning for there rats who are often more spoilt than there owners. At minimum a fan and adequate ventilation such as opening windows should be provided for the summer months. Rat Room A rat room is similar in principle to a rat shed in that it is a self contained space for your rats, rat stuff and free ranging area. However being inside your house it should maintain its temperature (assuming the central heating is working). Having thicker walls than a shed it also should keep cooler in summer too but car must be taken to select a rat room outside of direct sunlight (ideally not south facing) unless the window is small and can be covered and the rats can be kept well out of the direct sunlight. Having a rat room can really make rat ownership easier, especially if you can invest the time and money required to improve it for rats. Laying a laminate floor or similar smooth water proof surface makes it much easier to clean up after messy rats as well as cutting down on the dust that can be trapped and held by carpets. Tough paint designed for messy areas such as children’s bedrooms or utility rooms mean you can wipe down the wall and Perspex wall shields can be put up behind cages to make this even easier. You can also add storage for all your rat bits and create a free ranging space, ready populated with toys and climbing frames. It is also possible to use your rat room as a permanent play space for your rats if it is adequately rat proofed with no potential long drops, anything you mind being chewed to death or wires. It is nice to have a cage still for the rats to retreat into and it would be necessary to have some sort of rat gate to prevent escape when you open the door but it would allow a great amount of space for your rats, though potentially extend the cleaning out time. This is what you use to cover the floor of your rat cage or litter trays. It’s main purpose is to absorb urine and help minimise smells. It is possible to have no substrate or litter but this would require daily (or more frequent) wipe downs of surfaces as any litter absorbs the urine and so prevents a build up of urea which isn’t good for ratty lungs. The choice of substrate is a pretty important one particularly with a significant proportion of the informed rat world avoiding the most well known substrate of sawdust. There is more information for you to help you make your own choice here. Bedding varies in it’s importance with the rat, it is much loved by most does who love to build extravagant nests. Even the most lazy buck often enjoys dragging bits of paper around though they seem to have as much fun pushing it out of where it should be to somewhere else, however some rats seem to ignore it and would rather sleep on a flat plastic surface or a snuggely hammock. Your choice of bedding should reflect this, whilst it is important to offer some bedding a buck who at most wants to eat it should be offered less than a cage full of does bent of building the largest most complex nest known to rat kind. As with litter it can be important to recognise the absorbency of the nesting material, particularly with rats who are too lazy to leave there nests for the loo but again it’s structural properties should be more important if you have a nest building fanatic. It is also worth considering how insulating the bedding is, this is more important if you have very young, very old or sickly rats who struggle more with temperature regulation. Hairless, rex or patchwork rats with thinner or no fur will also potentially need more/warmer bedding though this will vary with the time of the year and how many rats you keep. Lone rats will need more bedding as they do not have the benefit of a friend to keep warm with. Cage accesories are the functional items that hold your cage together such as water bottles, shelves, food bowls etc. 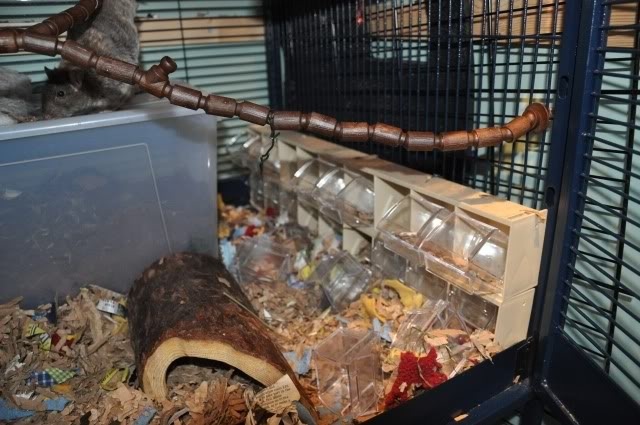 There are many possibilities when it comes to cage accessories, many of these are sold specifically for rats and other small animals but there are also many available that are sold for completely different purposes and with some imagination and very basic DIY skills you can transform them into a working part of your cage. Some of the options when it comes to cage accessories are discussed in more detail here. Rats are highly intelligent interactive creatures and so need plenty of stimulation to keep them from becoming bored. Toy’s can be bought or found from a variety of sources and you can offer many methods of enrichment with a little thought. Indeed with a bit of imagination you’ll soon be scouring hardware shops as much as pet shops for the rats. They needn’t be expensive, as with children rats will have as much, if not more fun, with the box. This page has some ideas of what you can do for your rats in terms of in cage enrichment and toys.